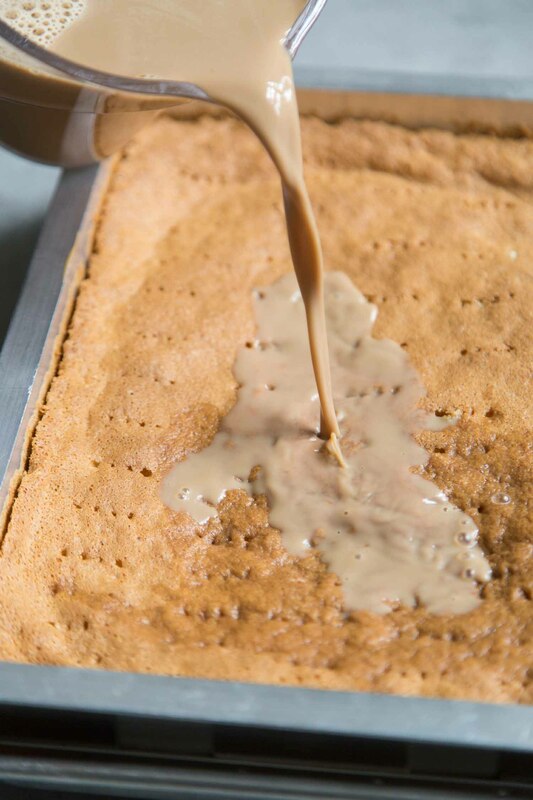 This Vietnamese Coffee Poke Cake is a sheet sponge cake soaked in a sweetened condensed milk coffee mixture. It is similar to tres leches cake. Sheet cakes. They’re the easiest way to feed a crowd some cake. No need to worry about stacking layers or making sure the cake layers are even. No stress about decorating. And my favorite part, sheet cakes are so easy to slice and serve. 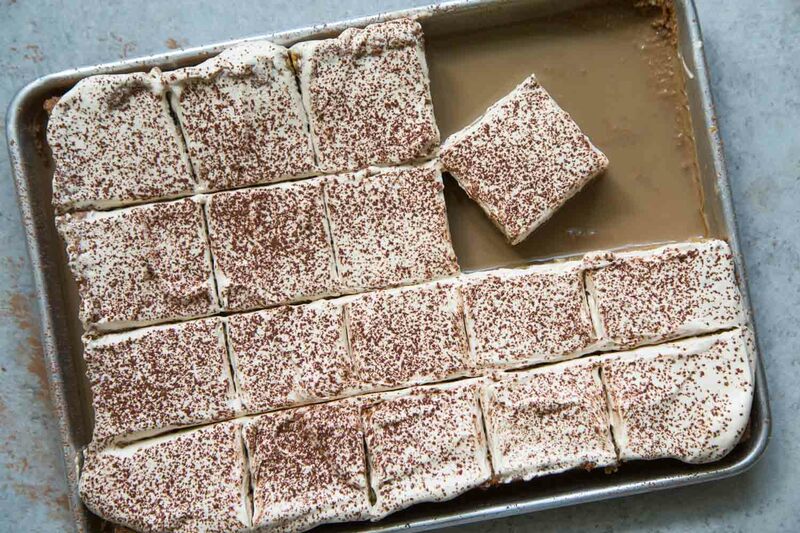 Tres Leches Cake has always been my go-to sheet cake… until now. Vietnamese Coffee Poke Cake has taken over. Vietnamese coffee (also known as “cà phê đá” or “cafe da”) is a mixture of dark roast coffee and sweetened condensed milk. It is usually made using a strong drip coffee (often with chicory). It can be enjoyed warm or served over ice. Every time I eat pho or bun rice noodles, I require a giant iced Vietnamese coffee afterwards. It’s sweet enough to be considered dessert, but I enjoy it for the rush of caffeine that’s much needed after a filling meal. 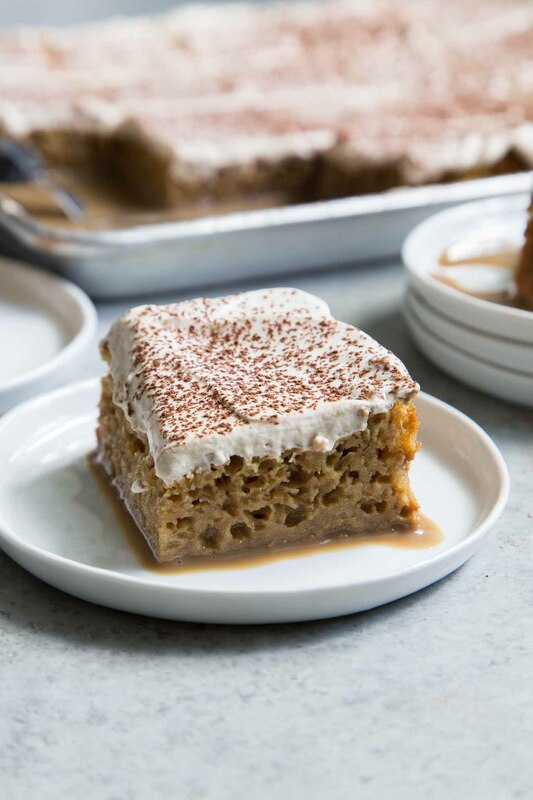 This coffee poke cake starts off like a traditional tres leches cake. While many poke cakes use store-bought cake mix, I find cake mixes way too sweet and moist. Poke cake are better suited for dry cakes. The drier the cake, the better it can absorb liquids. I used a standard sponge cake recipe in which the egg whites and egg yolks are mixed separately. The whipped egg whites help to create the fluffy, soft texture of the sponge cake. After baking, the sponge cake gets “poked” all over. Use the tines of a fork, toothpicks, or chopsticks. The most exciting part comes next. Pour the Vietnamese coffee mixture all over the cake. Within 30 minutes or so, the sponge cake will absorb all the sweet coffee goodness. 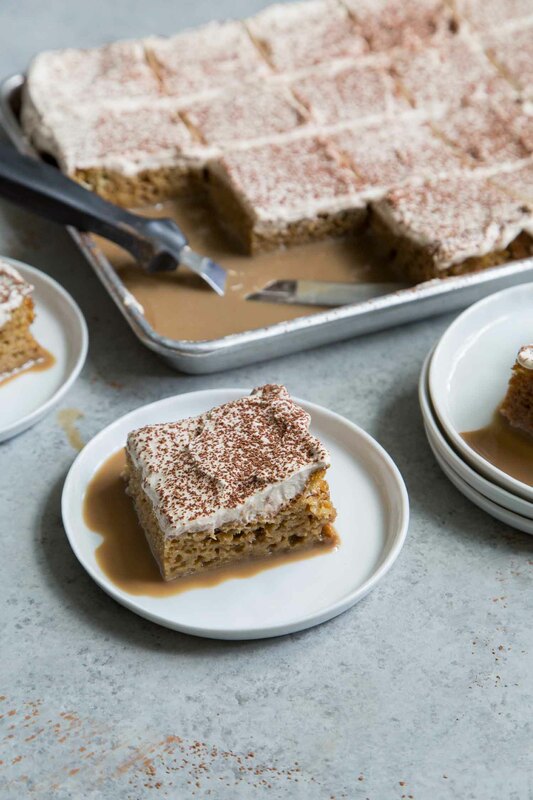 Before serving, the coffee poke cake is topped with espresso whipped cream and dusted with unsweetened cocoa powder. Slice up the cake and serve immediately! The cake slices will lift from the cake pan clean. As it sits on the clean serving plate, it will slowly ooze out sweet coffee… which only makes it more alluring. Sheet sponge cake soaked in a sweetened condensed milk coffee mixture. 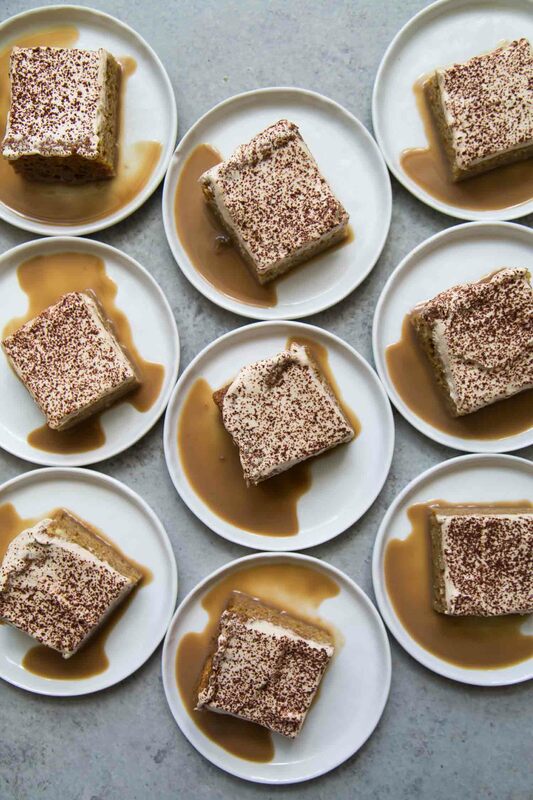 Topped with espresso whipped cream and dusted with cocoa powder, this Vietnamese Coffee Poke Cake is great for all sorts of celebrations, even brunch! Preheat oven to 350 degrees F. Butter a 9"x13" baking pan and line with parchment paper. Set aside. Using a stand mixer or hand held mixer, whip together egg yolks and sugar on medium speed until mixture has thickened and is pale in color. Add milk and mix until incorporated. Add dry flour mixture and mix until combined. In a clean bowl, using a hand held mixer, whip whip egg whites to medium peaks. In three additions, gently fold whipped egg whites into batter. Fold until there are no longer any white streaks of egg whites. Be careful not to overmix. Transfer cake batter to prepared baking pan. Spread into an even layer. Bake for 35 minutes until top of cake is golden brown and a toothpick inserted in center of cake comes out clean. 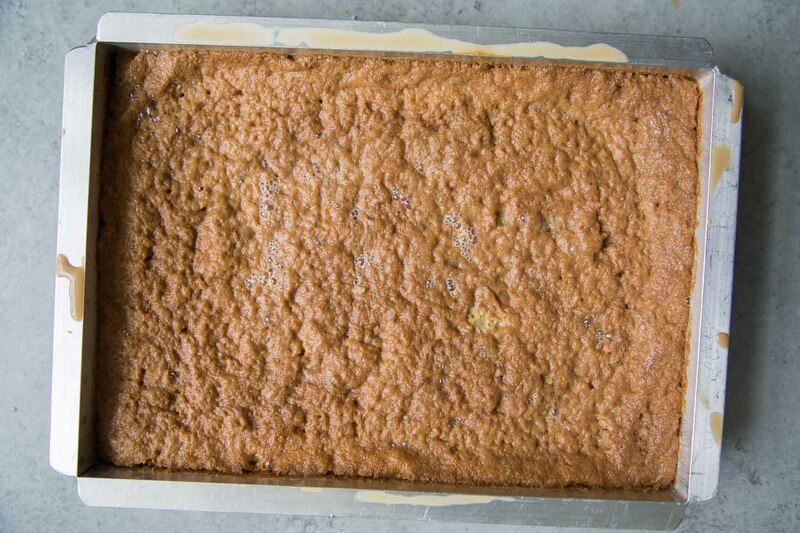 Leave cake in pan and let cool to room temperature. While the cake is cooling, combine sweetened condensed milk with warm coffee. Stir in instant espresso powder until dissolved. 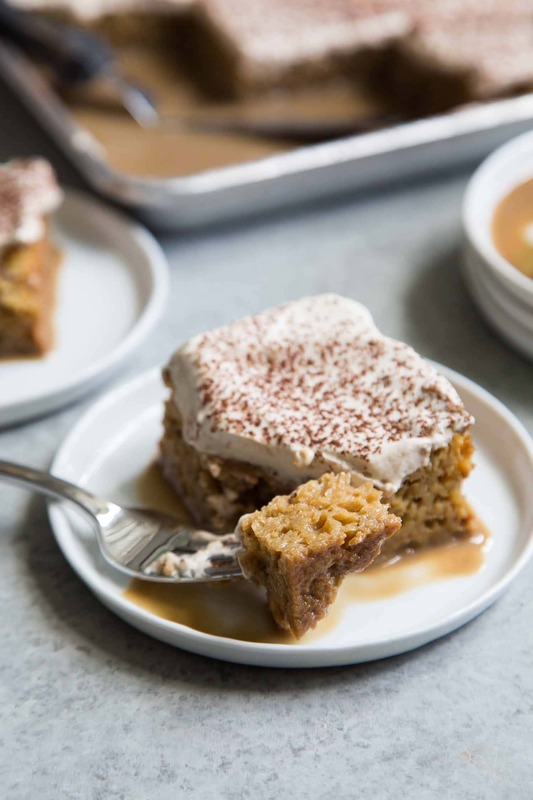 In a chilled bowl, whisk together cold heavy cream, confectioners' sugar, and instant espresso powder. Whip to medium stiff peaks. Spoon over coffee soaked cake. 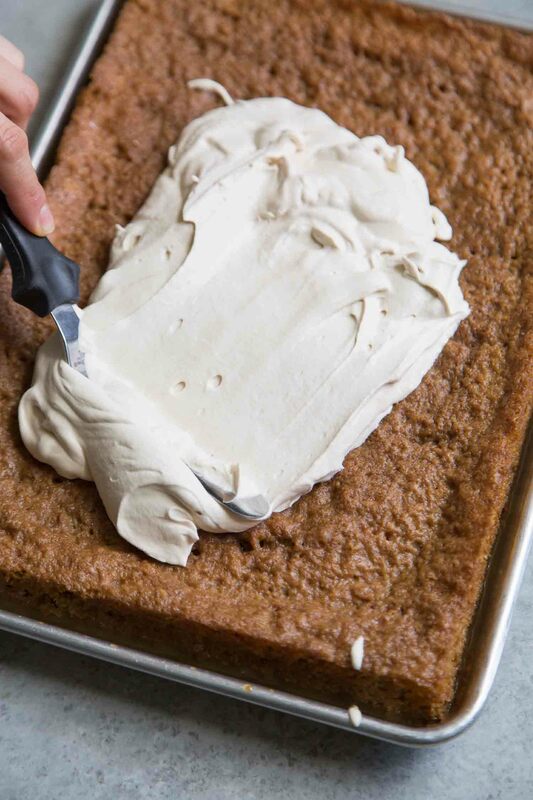 Use an offset spatula or the back of a spoon to evenly distribute whipped cream. Dust sifted unsweetened cocoa powder over cake. Slice and serve immediately. Do not frost the cake until you are ready to serve. If you are making the cake ahead of time, store soaked cake covered in the fridge for up to 2 days. Interested in more sheet cakes? Two of my favorite things in one! Can’t ever go wrong with coffee and cake! I love the ease of a sheet cake and this sounds (and looks!) amazing!! Yum!